Credit: Courtesy of NASA/STScI/ESO/Afanasiev et al. Fornax UCD3 is a part of a Fornax galaxy cluster and belongs to a very rare and unusual class of galaxies – ultracompact dwarfs. The mass of such dwarf galaxies reaches several dozen millions of solar masses and the radius, typically, does not exceed three hundred light years. This ratio between mass and size makes UCDs the densest stellar systems in the Universe. "We have discovered a supermassive black hole in the center of Fornax UCD3. The black hole mass is 3.5 million that of the Sun, similar to the central black hole in our own Milky Way" explained Anton Afanasiev, the first author of the article, a student of the department of the Faculty of Physics, MSU. 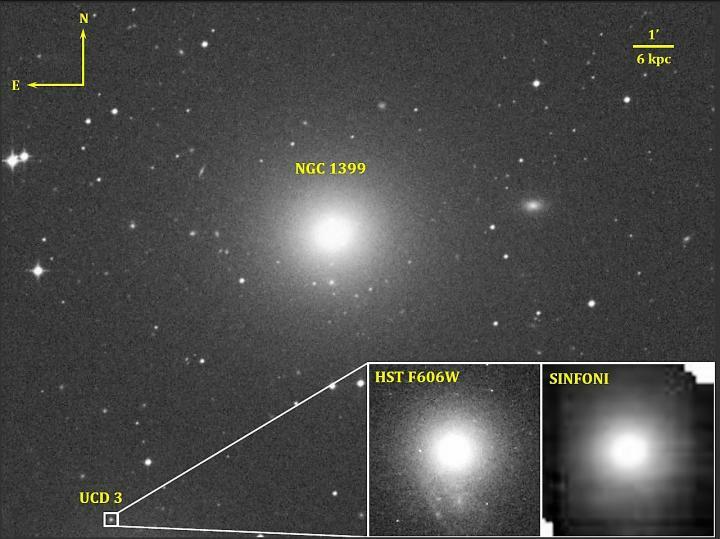 In the course of the study the scientists used the data collected with SINFONI, an infrared integral field spectrograph installed at one of the 8-m VLT telescopes in Chile operated by the European Southern Observatory. Having analyzed the observed spectra, the authors derived the dependence between stellar velocity dispersion and radius in Fornax UCD3. Velocity dispersion quantifies the average variation between the individual stellar line-of-sight velocity and the mean velocity of the entire stellar population. In the presence of a massive body such as a black hole the stars are influenced by its gravity and accelerate in various directions. Due to that their average speed does not grow but the dispersion increases considerably. This is the very effect that was observed in this galaxy: the velocity dispersion in its center is so high that it can only be explained by the presence of a massive central black hole. After that the scientists compared the dependence of velocity and dispersion with dynamic models based on different assumptions of the black hole mass. They found that the model suggesting the mass of the black hole being equal to 3.5 million solar masses agreed with the observations best. They also considered the possibility that no black hole was present there at all, but that hypothesis was excluded with the statistical significance of (99.7%). The black hole discovered by the authors is the fourth ever to be found in UCDs and corresponds to 4% of the total galaxy mass. In "normal" galaxies this ratio is considerably lower (about 0.3%). Despite there are few known examples, the existence of massive black holes in UCDs is a strong argument for the tidal origin of such galaxies. According to this hypothesis, an average-sized galaxy passed a bigger and more massive one on a certain stage of its evolution and as a result of influence of tidal forces lost the majority of its stars. The remaining compact nucleus has become what we know as an ultracompact dwarf. "To be able to say with complete assurance that this hypothesis is correct, we need to discover more supermassive black holes in UCDs. This is one of the prospects of this work. Moreover, a similar methodology may be applied to more massive and less dense compact elliptical galaxies. In one of our next works we will study the population of central black holes in objects of this kind," concluded the scientist. The work was carried out in collaboration with the scientists from the European Southern Observatory (Germany and Chile), Max Planck Institute for Astronomy, Institute for Astrophysics Potsdam (Germany), University of Michigan, San Jose State University, Texas A&M University, University of Utah, University of California (USA), Australian Astronomical Observatory, Macquarie University, University of Queensland (Australia), as well as from Swiss Federal Institute of Technology Zurich.